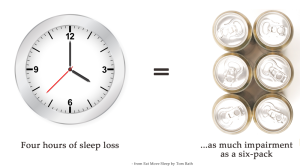 A few weeks ago, I wrote an essay for the Wall Street Journal that mentioned how four hours of sleep loss produces as much impairment as consuming a six-pack of beer. Do you want the person operating your car, train, bus, or airplane to have the equivalent of six beers before taking you to your destination? How would you feel if the surgeon that was about to operate on you only had a few hours sleep the night before? Should the person teaching your children show up for work in this state of impairment? Would it be okay for your manager to show up at work after a six-pack? Is it okay for your banker or accountant to essentially be drunk when making important decisions about your personal finances? You could insert almost any profession in this equation and our answer — as parents, patients, passengers, and customers — is a resounding “no.” Yet much of how we structure our work today is based on the flawed assumption that cutting sleep is a way to get ahead and be more effective. I think this rather unlikely. After a six pack of beer I’m unconscious. OK, doing a bit of research I have found that the original quote was more like “after four or five days of four hours a night you experience the same level of cognitive impairment as going 24 hours without sleep, equivalent to legal drunkenness”. That, I can believe. Simply missing a few hours for a single night is nowhere near that debilitating.